Colorado Springs Forgery Defense Attorney - Christian A. Schwaner, P.C. Forgery is a serious allegation. It involves the creation or possession of documents that are altered fraudulently. Colorado prohibits writing or forging documents in any way; if you are convicted of forgery, you face serious consequences. Also, being in possession of forged documents could lead to a conviction – even if you are not the one who forged the documents. Forgery under Colorado statutes is when one commits the act of falsifying, altering, completing, or offering as true a written document or instrument with the intent of defrauding another. Forgery of other types of documents is a felony in the second degree. It is not only a crime to create forged documents; it is a crime to be in possession of such documents. If you know the documents are forged and you possess them, you are committing a crime. The punishment for possession is more severe if the documents are legal or financial in nature. In Colorado, a person cannot be charged with possession and forgery. Instead, you must be charged with the act of possession or the act of forgery. It is illegal to alter or change academic records in any way. Whether it is a high school or college document, forging a document with the intent to use that falsified document for school, jobs, or a scholarship is illegal. Colorado does criminalize the possession of forgery tools. 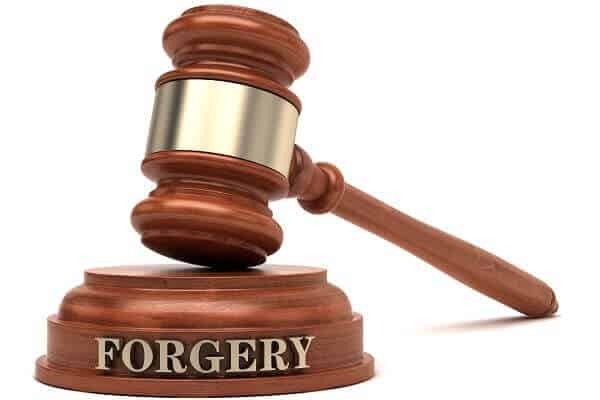 Therefore, if you are suspected of forgery and your home is searched, any forgery tools or tools associated with forgery can be assumed to be possession of forgery tools. You must prove that the forgery-related tools you have are used for legitimate purposes. Class 5 Felony – Punishable by one to three years in prison and a fine of $1,000 to $100,000. Class 6 Felony – This includes possession of legal or financial forged documents or a forgery device. You could face one year to 18 months in prison and a fine of $1,000 to $100,000. Class 2 Misdemeanor – Carrying other types of forged documents is a Class 2 misdemeanor. You could face 12 months in jail and a fine of $250 to $1,000. Class 1 Misdemeanor – This includes forging academic records. It it punishable by anywhere from six months to 18 months in jail and a fine of up to $5,000. Being accused of forgery is very serious. The fines alone are reason enough to contact an attorney. If you have been arrested, do not wait to contact an attorney. You need a criminal defense attorney who understands the Colorado justice system and can help protect you from the harsh penalties associated with this crime. Schedule a consultation with Christian A. Schwaner, P.C. now by calling 719-577-9700 or filling out our contact form.